Singles Knockout runner up - James Gilpin. 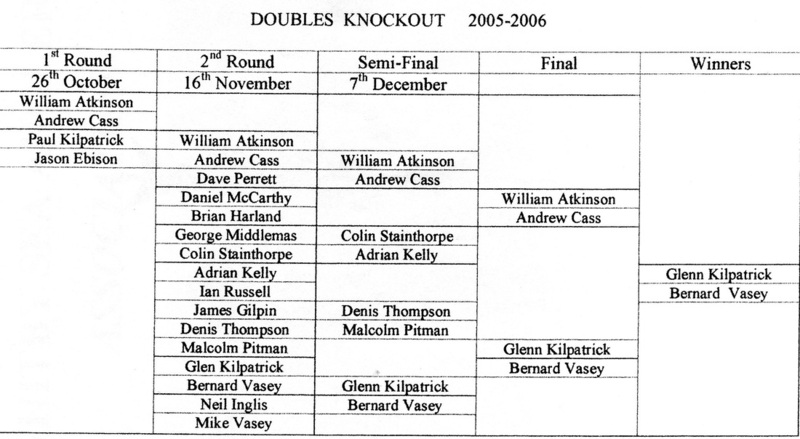 Doubles Knockout winners - Glen Kilpatrick & Bernard Vasey. 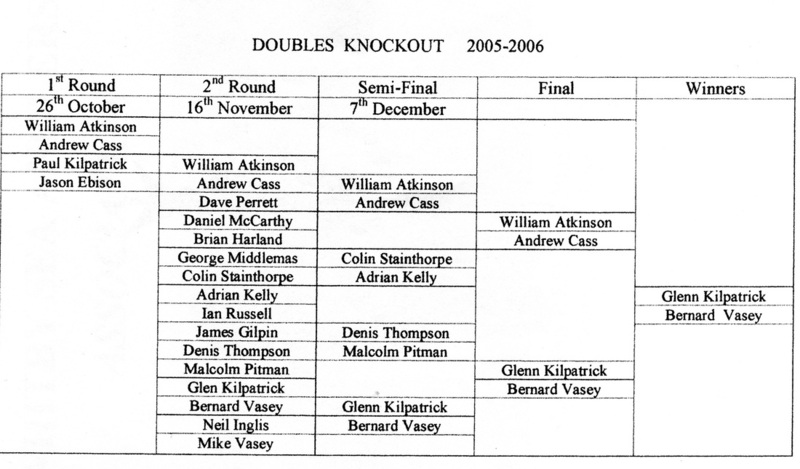 Doubles Knockout runners up - William Atkinson & Andrew Cass. 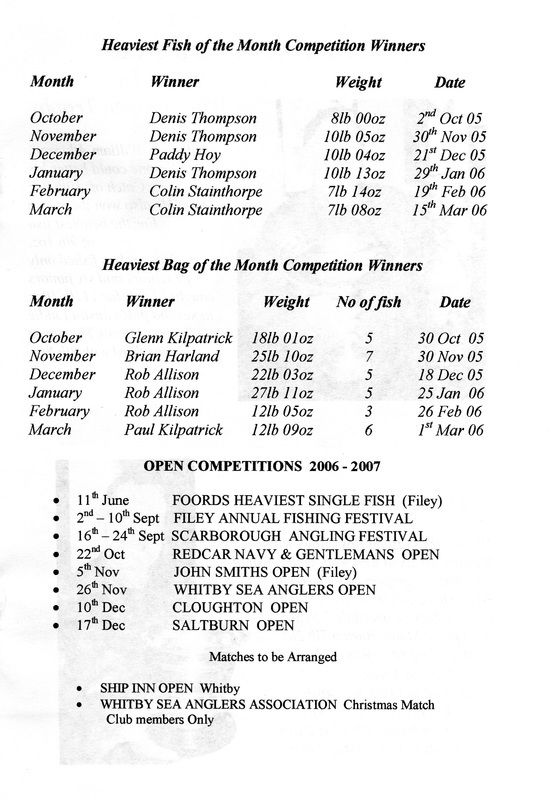 Heaviest Fish in a competition - Denis Thompson - 10 lb 14 oz (Bell Trophy 29th January 2006). Heaviest Fish out of competition - Mike Vasey - 9 lb 00 oz. Christmas match winner - Glen Kilpatrick - 6 lb 00 oz - 10 fish. Christmas match Heaviest Fish - - lb oz. Greatest number of fish - Glen Kilpatrick - 157 fish. Heaviest Bag of Fish - Rob Allison - 27 lb 11 oz - 5 fish (27th January 2006). 1st - Darren Hanson - 32 lb 15 oz - 16 fish. 2nd - Dave Smith - 22 lb 03 oz - 32 fish. 3rd - Dave Waters - 20 lb 11 oz - 21 fish. Junior Heaviest Bag - Darren Hanson - 7 lb 00 oz - 3 fish - 1st March 2006. Another of 6 lb 12 oz - 2 fish - 15th March 2006. No mention on either occasion of Heaviest Fish. Juniors Heaviest Fish - Dave Waters - 5 lb 01 oz. Total weight for the season - 2,054 lb 10 oz. Total Number of fish - 1,451. Press Secretary - Glenn Kilpatrick. Notes:- 29-12-2012 PDH taken from ledger. 2nd October 2005 - Heaviest Bags. Brian Harland - 15 lb 14 oz - 7 fish. Denis Thompson - 15 lb 11 oz - 6 fish, including one of 8 lb 00 oz. Jason Ebison - 11 lb 12 oz - 5 fish. 16th October 2005 - Heaviest Bags. James Gilpin - 14 lb 12 oz - 5 fish, including one of 8 lb 01 oz. Brian Harland - 14 lb 11 oz - 5 fish. Rob Allison - 11 lb 00 oz - 3 fish. 19th October 2005 - Denis Thompson Heaviest Bag - 13 lb 02 oz - 3 fish. 23rd October 2005 - Heaviest Bags. Rob Allison - 14 lb 07 oz - 6 fish. William Atkinson - 13 lb 06 oz - 4 fish. Dave Perrett - 12 lb 03 oz - 3 fish. Paul Kilpatrick - 10 lb 01 oz - 3 fish. 30th October 2005 - Heaviest Bag. Glen Kilpatrick - 18 lb 01 oz - 5 fish. George Middlemas - 10 lb 00 oz - 3 fish. 6th November 2005 - Heaviest Bags. Phil Mead - 14 lb 13 oz - 26 fish. Dave Perrett - 10 lb 09 oz - 18 fish. 9th November 2005 - William Atkinson heaviest Bag - 10 lb 08 oz - 18 fish. 13th November 2005 - Heaviest Bags. Rob Allison - 18 lb 05 oz - 5 fish. George Middlemas - 14 lb 07 oz - 4 fish. 30th November 2005 - Heaviest Bags. Brian Harland - 25 lb 10 oz - 7 fish. Denis Thompson - 21 lb 07 oz - 5 fish. George Middlemas - 15 lb 04 oz - 5 fish. Adrian Kelly - 14 lb 06 oz - 3 fish. Rob Allison - 12 lb 15 oz - 4 fish. Glen Kilpatrick - 12 lb 08 oz - 2 fish. 7th December 2005 - Dave Perrett Heaviest Bag - 15 lb 02 oz - 5 fish. 14th December 2005 Brian Harland Heaviest Bag - 12 lb 12 oz - 4 fish. 21st December 2005 Heaviest Bags. Glen Kilpatrick - 11 lb 04 oz - 17 fish. Paddy Hoy - 10 lb 04 oz - 1 fish. 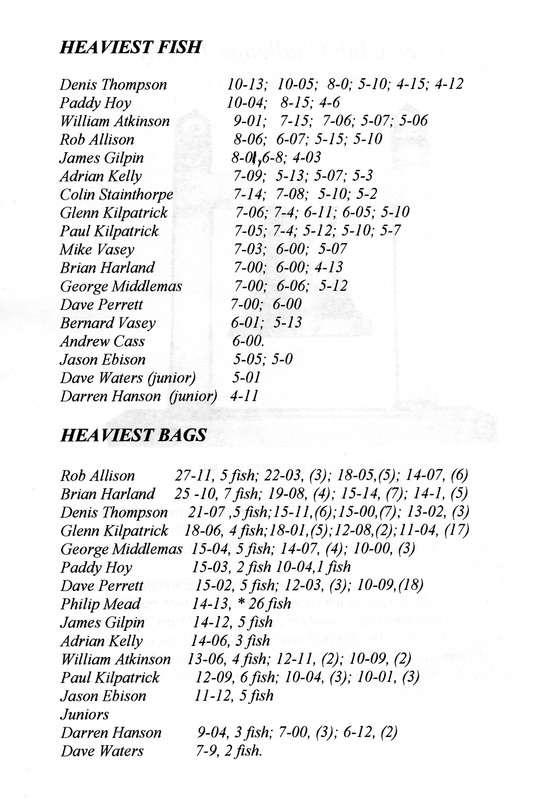 14th January 2006 - Heaviest Bags. Glen Kilpatrick - 11 lb 01 oz - 17 fish. Rob Allison - 10 lb 08 oz - 14 fish. Denis Thompson Heaviest Bag - 15 lb 00 oz - 7 fish. Paul Kilpatrick - 6 lb 04 oz - 2 fish, including one for 5 lb 13 oz. 15th January 2006 - Paddy Hoy Heaviest bag - 15 lb 03 oz, including one for 8 lb 15 oz. 27th January 2006 - Rob Allison Heaviest Bag - 27 lb 11 oz - 5 fish. 19th February 2006 - Colin Stainthorpe Heaviest Fish - 7 lb 14 oz, part of a bag of 2 fish for 8 lb 05 oz. 26th February 2006 - Rob Allison Heaviest Bag - 12 lb 05 oz - 3 fish. 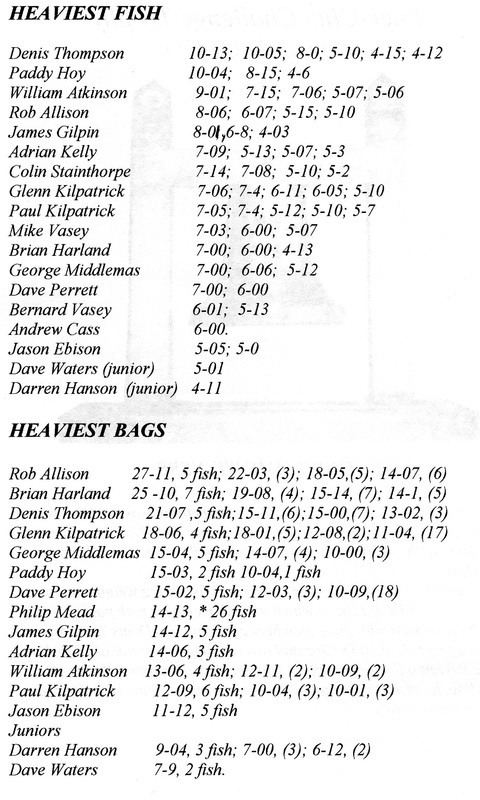 1st March 2006 - Paul Kilpatrick Heaviest Bag - 12 lb 09 oz - 6 fish. 12th March 2006 - William Atkinson Heaviest Fish - 7 lb 06 oz, part of a 9 lb 15 oz bag of 2 fish. Strong westerly winds and heavy rain greeted Whitby Sea Anglers for the first match of their 6 month season. Flat calm seas and clear water meant codling were hard to find. Last years junior champion Dan McCarthy now competing well with the seniors won the match with 6 whiting weighing 3 lb 11 oz. In second place was new junior Dan Smith with 5 whiting for 2 lb 10 oz. A northerly sea swell and coloured water meant conditions were much more favourable for Sundays match and this was reflected in the results with 22 anglers bringing an assortment of codling, billet, whiting and rocklings to the scales. Brian Harland won the match with 7 codling weighing 15 lb 14 oz. Denis Thompson set the pace for the heaviest fish of the month with a fine cod of 8 lb 00 oz. Flat calm seas and clear water meant conditions were unfavourable for codling fishing which was reflected in the results with no cod being brought to the scales. James Gilpin won the match with 4 billets and 1 whiting weighing 4 lb 07 oz in total. Conditions were again calm for Sundays high tide match. Brian Harland won the match with a mixed bag of 2 codlings and 3 billets for a total weight of 6 lb 04 oz. This small low to flood tide match was fished on a very warm evening with a light long distance northerly swell in the water. Brian Harland continued his excellent start to the season with his third win out of 5 matches so far. Anglers fished this ebb tide match with a decent south easterly sea swell in the water. James Gilpin continued his excellent start to the season with a personal best bag of 5 fish weighing 14 lb 11 oz. James also beat his personal best fish with a fine cod of 8 lb 01 oz. This ebb tide match was fished with dying south easterly sea swell and coloured water. Denis Thompson manged ti find fish and brought 3 cod to the scales which weighed 13 lb 02 oz in total. Anglers fished a dying northerly sea swell over high water. Fifteen anglers returned to the scales with fish. Four anglers had double figure bags. Conditions were calm for this small low to flooding tide match. Andrew Cass caught a 6 lb cod from his chosen venue which gave him his first win of the current season. Whitby Sea Anglers were met by strong south westerly winds for this low tide match. Glenn Kilpatrick won the match with 5 fish for 18 lb 01 oz. Glenn also won the sweep for the heaviest bag of fish for October, as did James Gilpin for the heaviest fish 8 lb 01 oz. Wednesday's match saw anglers fishing an ebb to low water tide with a slight south easterly sea swell in the water. Fifteen anglers weighed-in a variety of species including - codling, whiting, pollock, coal fish (billet) and rocklings. Colin Stainthorpe won the match with 2 fish for 6 lb 02 oz. The whiting were late to arrive this year but Sunday's high water - ebb tide match saw them arrive on mass. Phil Mead was kept busy throughout the 4 hrs match and enjoyed his first win of the season with a fine bag of 26 whitings for 14 lb 13 oz. Flat calm conditions meant codling were hard to find for Whitby Sea Anglers. This was reflected in the results with Denis Thompson showing great skill to land the only cod of the night weighing 5 lb 10 oz. William Atkinson changed tactics and targeted the whiting which gave him first place with 18 fish for 10 lb 08 oz. Junior angler Dave Smith continued his recent good form with 5 fish for 3 lb 13 oz which put him in first place in the junior section just ahead of Darren Hanson and Dave Waters. A heavy north easterly sea swell provided good conditions for the Whitby Sea Anglers' 4 hr match. However the results were rather disappointing with only 2 anglers catching double figure bags and some anglers struggling to locate any fish at all. Rob Allison had a good night and managed to find 5 fish for 18 lb 05 oz, a catch which now leads the way in the heaviest bag of the month and season competitions. George Middlemas took second place with 4 fish for 14 lb 07 oz and the biggest of which, a fish of 7 lb, is now the heaviest fish of the month so far. Members of the Whitby Sea Anglers club were met by strong north west winds and heavy wintry showers when they turned out to fish their 3 hr mid week match. A big north westerly swell and coloured water provided good conditions but results were again not as good as could be expected for this time of year. Glenn Kilpatrick won the match with 3 fish for 9 lb 07 oz. Junior member Dave Waters had a great night catching 2 fish for 7 lb 09 oz the biggest of which, a cod of 5 lb 01 oz, is now the heaviest fish in the junior section. 21 members entered and 8 weighed in, 21 fish for 33 lb 07 oz. Winner William Atkinson - no one could better his catch of 10 lb 09 oz. He also won the sweep for the Heaviest Fish of 9 lb 01 oz. 108 anglers fished and only 19 seniors and 6 juniors caught 51 fish for 111 lb 10 oz. 2nd was Justin Liddle 8 lb 10 oz. 3rd Denis Thompson - 8 lb 08 oz. 2 fish, including one for 9 lb 01 oz. Flat calm conditions on this frosty night meant codling were hard to find in this 3 hr match. Again Denis Thompson came up with the goods and found the only 2 codlings of the night weighing 2 lb 14 oz in total to win the match. A big northerly sea swell over low water gave excellent conditions for Whitby Sea Anglers. Denis Thompson continued his recent good run taking first place with 3 fish weighing 8 lb 14 oz. Mike Vasey came a close second with 2 fish for 7 lb the biggest of which was the heaviest fish of the night weighing 5 lb 07 oz. Whitby Sea Anglers were met by excellent conditions for their 3 hr midweek match. A dying northerly sea swell with coloured water at most venues meant catches were well up on those of late. Six anglers returned to the scales with double figure bags and both the heaviest fish and bag of the season were beaten. Brian Harland recaptured his early season form and won the match with 7 fish for 25 lb 10 oz which is now the heaviest bag of the season. Denis Thompson came a close second with 5 fish for 21 lb 07 oz the biggest of which, a fine cod of 10 lb 05 oz, is now the heaviest fish of the season to date. 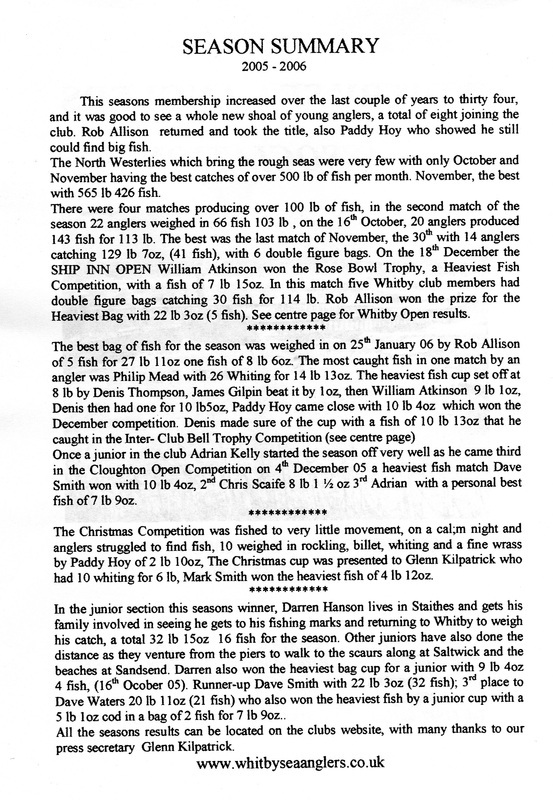 Sundays match saw Whitby Sea Anglers fishing both their own club match and the Cloughton Open which was a heaviest fish match. Adrian Kelly managed 3rd place overall in the Cloughton Open with a fish 7 lb 09 oz. 13 members entered and 9 weighed in, 11 fish for 40 lb 13 oz. Wednesday's match was fished over high tide with a slight north easterly swell in the water. Dave Perrett rediscovered form and won the match with 5 fish for 15 lb 02 oz. William Atkinson who continues to fish well took second with 3 fish for 8 lb 09 oz. 30 members entered and 10 weighed in, 27 fish for 24 lb 12 oz. 1 fish - Heaviest Fish. On a fine night Whitby Sea Anglers fished this low water match with a moderate north westerly sea swell in the water. Brian Harland won the match with 4 codlings for 12 lb 12 oz. 20 members entered and 13 weighed in. 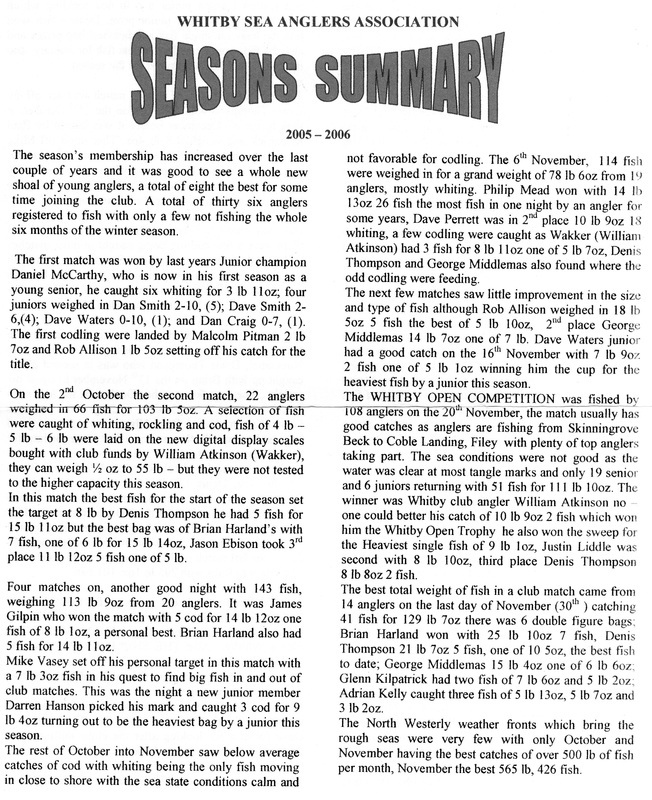 In the last match of 2005 the conditions were poor for codling fishing which meant the majority of Whitby Angling club headed for the soft ground in search of whiting. However Paddy Hoy persevered on the rocks and was rewarded with his heaviest fish of the season, a fine double figure cod of 10 lb 04 oz which gave him second place in the nights match and won him the sweep for the heaviest fish of the month. Monday saw some of the Whitby Sea Anglers fish the Saltburn New Year sweep stake. 37 anglers turned out for the Saltburn heaviest single fish sweep stake which was fished over low water from The Gare to Whitby, with a little bit of sea running results were not too bad. Heaviest bag - Paul Lobley 3 cod 17 lb 13 oz - £40. Members of Whitby Sea angling club were met by calm conditions on their return after the Christmas mid season break. The majority of anglers again headed onto the beaches in search of whiting. Glenn Kilpatrick won the match with 17 whitings for 11 lb 01 oz. Out of the handful of anglers who persevered on the rocks Paddy Hoy showed great skill to land the nights only codling weighing 1 lb 12 oz. 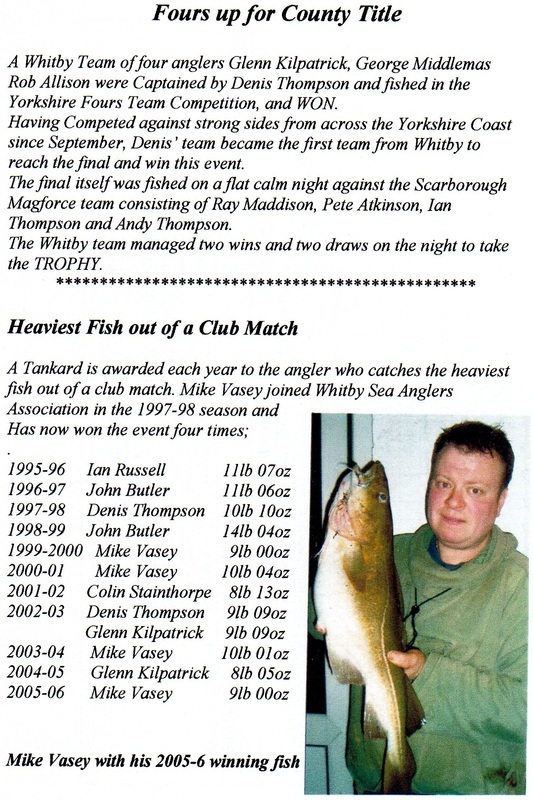 Whilst out pleasure fishing on Friday night, Whitby club member Mike Vasey caught a fine cod of 8 lb 15 oz which now takes the lead in the club competition for the heaviest fish outside of a club match. Mike's fish went 10 oz better than previous best which was an 8 lb 05 cod caught by Paul Kilpatrick back in November 2005. Sunday's match was fished on a small flooding tide with a dying easterly sea swell in the water. On a night when fish were difficult to locate for some, Denis Thompson used his years of experience to take first place with 7 fish for 15 lb. Paul Kilpatrick came in second with 2 fish for 6 lb 04 oz, the biggest of which a cod of 5 lb 12 oz is the heaviest fish of the month to date. There was a slight long distance swell in the water for Wednesdays match which was fished over a small low water tide. Glenn Kilpatrick won the match with 6 fish for 3 lb 06 oz. In the clubs Junior section Dave Waters caught a nice codling of 2 lb 03 oz and reported losing another codling whilst winding in. This takes Dave into second place, just behind the current top Junior Dave Smith. A large ebbing tide with only slight south south easterly swell in the water meant conditions were again unfavourable for the Whitby Sea Anglers. Despite the poor conditions Paddy Hoy continued his excellent form since joining the club at the end of November. Paddy returned to the scales with 2 cod for 15 lb 03 oz, the biggest of which weighed 8 lb 15 oz. Paddy now leads the way with the heaviest fish and bag of the month. William Atkinson came in second with 8 whitings for 5 lb 09 oz. Brian Harland showed his all-round angling ability to return to the scales with a mixed bag of codling, whitings and flounders weighing 5 lb 07 oz which gave him third place in the match. The sea was again flat calm for the Whitby Sea Anglers mid week match which was fished over an ebbing tide. Most of the anglers again headed for the beaches which meant the catches were dominated by whiting and flounders with only 2 codling being brought to the scales - 1 each for George Middlemas and Malcolm Pitman. Brian Harland won the match with 8 whitings for 5 lb 11 oz. With a very slight amount of north westerly swell left in the water from Saturdays rough seas members of the Whitby Sea angling club fished their weekly Sunday match. Rob Allison won the match with 2 nice codlings weighing 9 lb 11 oz in total. Brian Harland again showed his all-round ability and took second place with a mixed bag of 2 codlings, 2 billets, 2 whitings and a flounder weighing 8 lb 10 oz in total. Mike Vasey came in 3rd with 3 fish for 7 lb 04 oz, the biggest being a 6 lb codling. A moderate north to north easterly sea swell provided excellent conditions for codlings in Wednesdays match. This was reflected in the results with Rob Allison taking the lead in the heaviest bag of the year competition with 5 fish weighing a total of 27 lb 11 oz. Colin Stainthorpe eventually refound his form of previous seasons and returned to the scales with 4 fish weighing 9 lb 05 oz, giving him second place on the night.Paul Kilpatrick continued a recent good run and took third place with a fish weighing 7 lb 04 oz. Paul returned to the scales with a story of the one that got away, he reports having lost a near double figure fish which he decided to try and lift out of the water using his rod rather than pick the fish out of the sea by hand, the fish simply fell off the hook and swam away. 10 members entered and only 3 weighed in!! 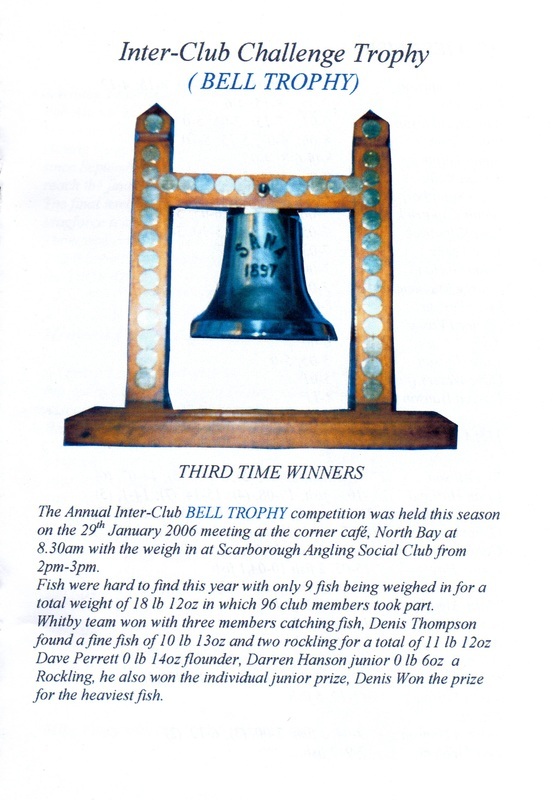 The Annual Inter-Club Bell Trophy competition was held, meeting at the corner cafe, North Bay at 8.30 am with the weigh in at the Scarborough Angling Social Club from 2pm - 3pm. Fish were hard to find this year with only 9 fish being weighed in for a total weight of 18 lb 12 oz in which 96 club members took part. Whitby Team won with 3 members catching fish, Denis Thompson found a fine fish of 10 lb 14 oz and 2 Rocklings for a total of 11 lb 12 oz. Dave Perrett 0 lb 14 oz flounder, Darren Hanson (Jnr) 0 lb 06 oz Rockling, he also won the individual junior prize, Denis won the prize for the heaviest fish. - Bernard Vasey. 11 lb 12 oz - 2 fish - Heaviest 10 lb 14 oz (Heaviest Fish of Season). 0 lb 06 oz - 1 fish. Anglers fished a big ebbing tide with a slight long distance northerly swell in the water. William Atkinson won the match with 3 codlings and a 1 billet weighing 6 lb 03 oz in total. Paul Kilpatrick continued his recent good run taking second place with 1 fish of 5 lb 07 oz. Denis Thompson came in third with 1 fish weighing 4 lb 15 oz. It was an eventful night for club angler Paddy Hoy who snapped a fish off whilst pulling it up the cliff he had chosen to fish from. Not happy with his loss Paddy decided to climb down the cliff and retrieve the fish from the bottom. Notes say 2pm - 8pm or night match 4pm - 10pm. 17 members fished and 10 weighed in 24 fish for 20 lb 02 oz. The Ship held an all in all out fishing competition on the 5th Feb fishing 2pm - 8pm a codling only match with the winner taking 50% of the total prize money. The conditions were not good with fairly clear water and only a slight northerly swell it was always going to be hard going, but there was the advantage of fishing into darkness which can make a massive difference when fishing for cod. Amazingly there was 2 very good cod which ended up first equal both weighing 10 lb 01 oz fell to Chris Scaife from Filey and Ray Madison from Scarborough, 2 excellent fish for the conditions. Paul Kilpatrick, who thought he had a good chance with his 5 lb 14 oz, for the conditions, was third. Mick Chadwick from Scarborough took the heaviest bag 7 lb 07 oz, as you could only win one prize per person which tends to spread the prizes out. Ray Maddison had 3 cod for 19 lb 10 oz but couldn't take the heaviest bag. 28 anglers fished the match. On 7th February a Whitby fours team captained by Denis Thompson including Glenn Kilpatrick, George Middlemas and Rob Allison won Yorkshire's Fours team competition. Having competed against strong sides from across the Yorkshire coast since September, Denis' team became the first team from Whitby to reach the final and win the event. The final itself was fished on a flat calm night against the Scarborough Magforce team consisting of Ray Maddison, Pete Aitkinson, Ian Thompson and ? Thompson. The Whitby team managed 2 wins and 2 draws on the night to take the trophy for the club. Whitby Sea Anglers were met by extreme conditions when they turned out to fish their mid week 3 hour match. Gale force northerly winds and huge waves meant a lot of the usual marks were unsafe to fish and so the majority of the anglers all turned up and shared the few marks that were accessible, fishable and safe. The severe weather meant codling were thin on the ground, however Brian Harland had a good night and managed to land 2 codling for 4 lb 06 oz. Denis Thompson landed second place with a codling of 1 lb 15 oz. Paul Kilpatrick continued his run of form managing to find a codling of 1 lb 09 oz to take third. With a dying sea swell and coloured water (ideal catching conditions) many of the clubs members took the opportunity to go pleasure fishing on Friday night. Bernard Vasey had a good night catching 4 codlings from his chosen mark but the best catches of the day went to Mike Vasey and Brian Harland. Whilst Brian had a fish of around 8 lb, Mike Vasey caught his heaviest of the season to date. Mike's fish weighed exactly 9 lb, beating his previous season best of 8 lb 15 oz, and now leads the way in the non match night heaviest competition. After the stormy conditions of midweek it was back to flat calm seas for the Whitby Sea Anglers 4 hour Sunday match. It was always going to be a difficult night and this was reflected in the results with no codlings being brought to the scales. Glenn Kilpatrick won the match with 8 whitings for 5 lb 12 oz. Brian Harland came in second with another mixed bag from the soft ground of whitings and flounders. Club angler Malcolm Pitman continued in his role of club specimen hunter. Having caught rare species in the club in the past, including skate, Malcolm returned to the scales with a dogfish which are very are on this particular part of the coast. The whitings showed en mass for the Whitby Sea Anglers midweek match. Rob Allison came in first place with 14 whitings for 10 lb 02 oz. In second place William Atkinson caught 9 for 6 lb 09 oz and Bernard Vasey found 8 for 6 lb 05 oz to take third. 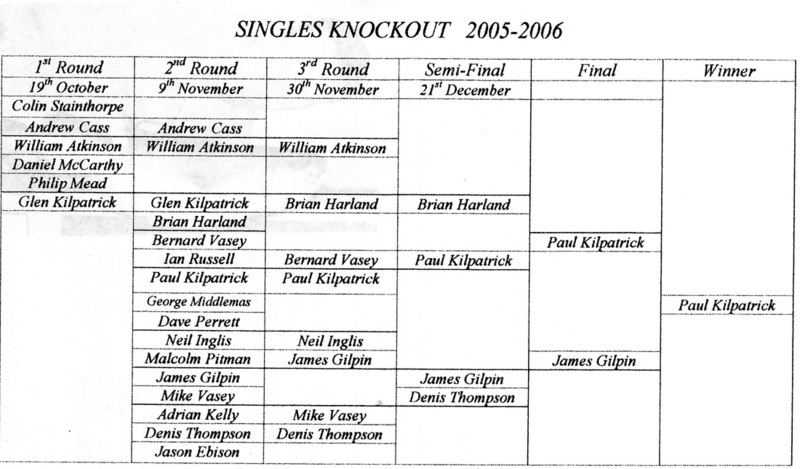 Wednesday's match also included the club knockout final which was won by Bernard Vasey and Glenn Kilpatrick (agg weight 9 lb 14 oz) who beat William Atkinson and Andrew Cass (agg weight 7 lb 06 oz). A slight to moderate north easterly sea swell with coloured water provided good conditions for codling fishing in this high water match. However with bigger fish now moving offshore to spawn it was difficult going for the Whitby Sea Anglers with no member catching more than 1 cod, Colin Stainthorpe had his first win since the 2nd November 2005. Colin had 2 fish (1 cod and 1 rockling) weighing 8 lb 05 oz in total. Rob Allison continued his recent good run and came in second with a single cod of 5 lb 15 oz. Glenn Kilpatrick came in third with 1 fish for 2 lb 12 oz. The small tide and easterly swell meant the water colour was starting to clear by Wednesdays midweek match. Such conditions are far from perfect for fishing, as the old saying goes when the winds in the east the fish bite the least, this was reflected in the results with only 5 codlings being brought to the scales. Club angler William Atkinson won the match with 2 small codling weighing a total of 3 lb. Mike Vasey came in second with 1 fish of 1 lb 09 oz, Philip Mead took third place with 1 codling of 1 lb 06 oz. Conditions were near perfect for this low water match. With a big northerly swell and the water starting to colour up again expectations of good catches were high. Rob Allison had an excellent night finding 3 fish for 12 lb 05 oz which gave him first place on the night. Denis Thompson came a close second with 4 fish for 8 lb 04 oz. Bernard Vasey took third place with a single fish of 4 lb 11 oz. The largest ebbing tide of the year meant the going was always going to be tough in this 3 hour midweek match. A northerly sea swell and very coloured water provided decent conditions however. Club angler Paul Kilpatrick showed it is still possible to catch fish under such conditions and returned to the scales with 6 codlings for 12 lb 09 oz. Junior member Darren Hanson fishing very close to Paul found 3 codlings for 7 lb exactly, which takes him into a clear lead at the top of the Junior section. A moderate north westerly sea swell and heavily coloured water meant conditions were near perfect for this high water match. Despite this catches were very poor indeed with only 4 codlings and 1 rockling being returned to the scales. Dave Perrett who reported losing a fish of around 15 lb whilst pleasure fishing on Thursday night returned to the same venue and was rewarded with 1 fish of 3 lb exactly which gave him first place on the night. Second place went to junior member Dave Smith who caught 1 fish weighing 2 lb 02 oz, Andrew Cass completed the places with 1 fish of 1 lb 15 oz. Club angler Mike Vasey reported hooking into another big fish in tonights match. Estimated to be a similar size to the fish lost by Dave Perrett on Thursday night, Mike says he was unable to pull the huge fish up the cliff face he had chosen to fish from. With March traditionally being a good month for bigger fish, and 2 being reportedly hooked in the last few days, there is a strong chance that someone will land the catch of a lifetime before the end of the month. The sea had fallen almost calm for Wednesday nights match. The results were the worst for many years with only 4 whitings being returned to the scales. What seemed like the coldest night for many years met the Whitby Sea Anglers for their Sunday night match. William Atkinson continued his good form and landed 2 fish for 9 lb 15 oz which took him into second place in the league, hot on the heals of current leader Rob Allison. A moderate north easterly swell and coloured water provided good conditions for Whitby Sea Anglers in their midweek match. Paul Kilpatrick had another excellent night finding 4 codlings on his last 4 casts of the night giving him a winning weight of 9 lb 01 oz. Anglers fished this high tide with a light northerly swell in the water. Catches were very poor with only 2 anglers weighing-in. Man of the moment Brian Harland found 2 codling for 4 lb 05 oz. Glenn Kilpatrick came in second with 2 whitings for 1 lb 04 oz. Anglers fished this small flood to high water tide with a nice north to north easterly swell in the water. Again results were rather poor with only 3 anglers returning to the scales with fish. Dave Perrett had an excellent night and managed 3 fish for 7 lb 07 oz. Brian Harland continued his recent good run finding 2 codlings for 5 lb 02 oz. 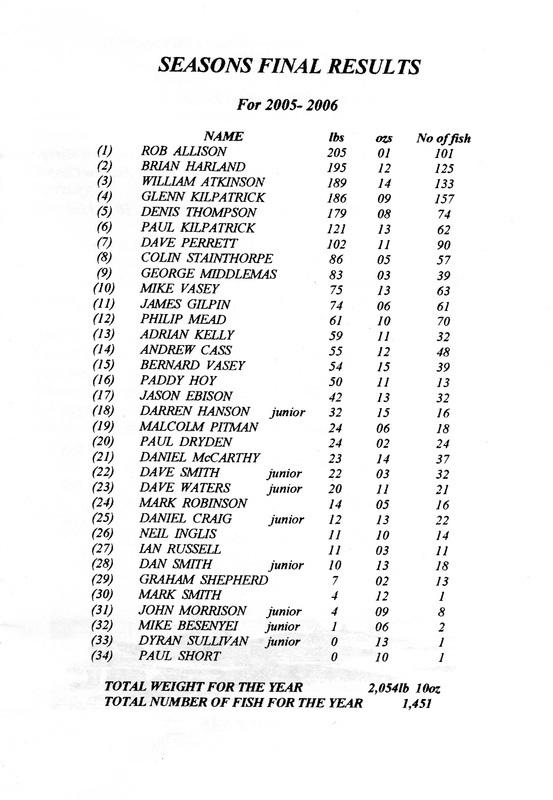 Brian's catch takes him into second place in the league and within 8 lb of the current leader Rob Allison. With only 2 matches of the season now remaining it looks like we are in for another thrilling finale. 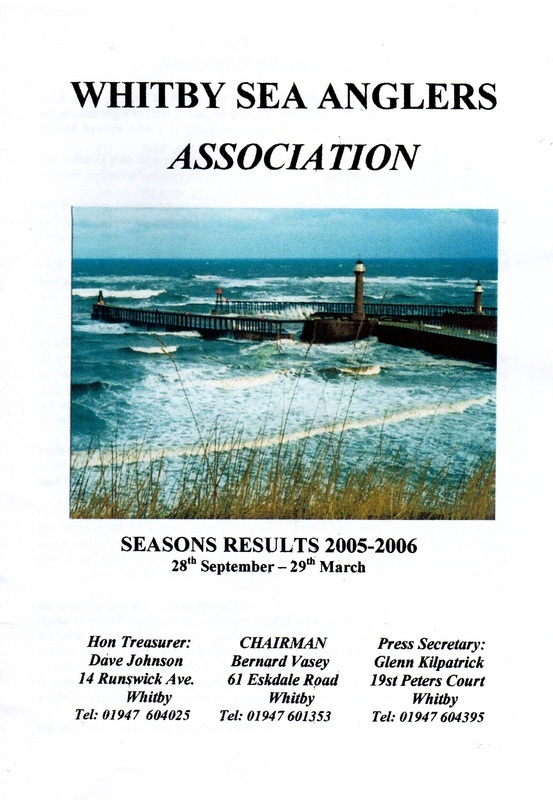 Flat calm seas and milder weather prevailed for the Whitby Sea Anglers final match for the season 2005/2006. Expectations of good catches were certainly not high and this was reflected in the results with only 1 angler returning to the scales with a fish. Brian Harland continued his late season good run and took first place in the nights match with a rockling of 10 oz. Brian's late season run came a little too late to give him chance of catching long term league leader Rob Allison, Brian came in a close second overall which is a great achievement in itself. 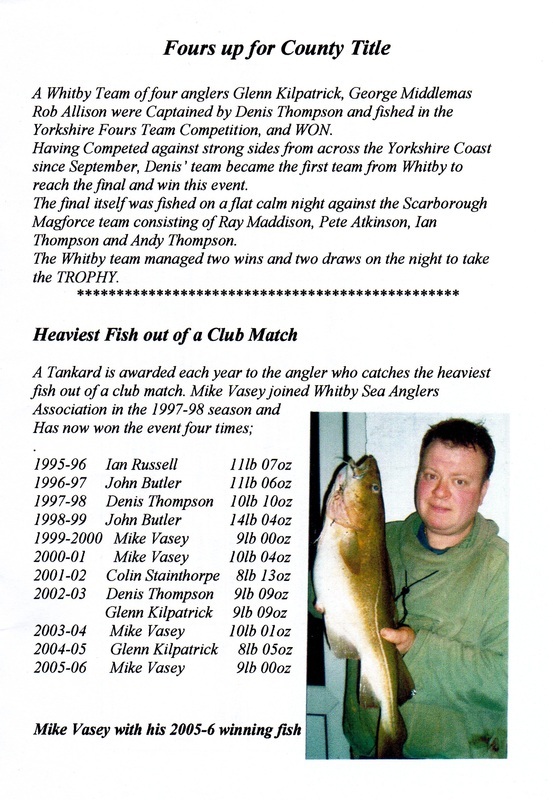 Rob after a year away from the club returned and took the title of Whitby Sea Anglers league inner 2005/2006. All members of the club congratulated Rob on his achievement. The seasons membership has increased over the last couple of years and it was good to see a whole new shoal of young anglers, a total of eight the best for some time joining the club. A total of 36 anglers registered to fish with only a few not fishing the whole six months of the winter season. The first match was won by last years Junior Champion Daniel McCarthy, who is now in his first season as a young senior, he caught six whiting for 3 lb 11 oz, four juniors weighed-in Dan Smith 2 lb 10 oz (5), Dave Smith 2 lb 06 (4), Dave Waters o lb 10 oz (1), Dan Craig 0 lb 07 oz (1). The first codling were landed by Malcolm Pitman 2 lb 07 oz and Rob Allison 1 lb 05 oz setting off his catch for the title. On the 2nd October the second match 22 anglers weighed in 66 fish for 103 lb 05 oz. A selection of fish were caught of whiting, rockling and cod, fish of 4 lb - 5 lb - 6 lb were laid on the new digital scales bought with club funds by William Atkinson (Wakker), they can weigh ½ oz to 55 lb - but they were not tested to the higher capacity this season. In this match the best fish for the start of the season set the target at 8 lb by Denis Thompson, he had 5 fish for 15 lb 11 oz but the best bag was of Brian Harland's with 7 fish, one 6 lb for 15 lb 14 oz, Jason Ebison took 3rd place 11 lb 12 oz, 5 fish one of 5 lb. Four matches on, another good night with 143 fish, weighing 113 lb 09 oz from 20 anglers. It was James Gilpin who won the match with 5 cod for 14 lb 12 oz one fish of 8 lb 01 oz, a personal best. Brian Harland also had 5 fish for 14 lb 11 oz. Mike Vasey set off his personal target in this match with a 7 lb 03 oz fish in his quest to find big fish in and out of club matches. This was the night a new junior member Darren Hanson picked his mark and caught 3 cod for 9 lb 04 oz turning out to be the heaviest bag by a junior this season. The rest of October into November saw below average catches of cod with whiting being the only fish moving in close to shore with sea state conditions calm and not favourable for codling. The 6th November, 114 fish were weighed-in for a grand weight of 78 lb from 19 anglers, mostly whiting. Philip Mead won with 14 lb 13 oz, 26 fish, the most fish in one night by an angler for some years, Dave Perrett was in 2nd place 10 lb 09 oz, 18 whiting, a few codling were caught as Wakker (William Atkinson) had 3 fish for 8 lb 11 oz one of 5 lb 07 oz, Denis Thompson and George Middlemas also found where the odd cod were feeding. The next few matches saw little improvement in the size and type of fish although Rob Allison weighed-in 18 lb 05 oz, 5 fish, the best 5 lb 10 oz. 2nd place George Middlemas 14 lb 07 oz one of 7 lb. Dave Waters(Jnr) had a good catch on the 16th November with 7 lb 09 oz, 2 fish one of 5 lb 01 oz winning him the cup for the heaviest fish by a Junior this season. The WHITBY OPEN COMPETITION was fished by 108 anglers on the 20th November, the match usually has good catches as anglers are fishing from Skinningrove Beck to Coble Landing, Filey with plenty of top anglers taking part. The sea conditions were not good as the water was clear at most marks and only 19 seniors and 6 juniors returning with 51 fish for 111 lb 10 oz. The winner was Whitby club angler William Atkinson no one could better his catch of 10 lb 09 oz, 2 fish which won him the Whitby Open Trophy, he also won the sweep for the Heaviest single fish of 9 lb 01 oz. Justin Liddle was second with 8 lb 10 oz, third place Denis Thompson 8 lb 08 oz, 2 fish. The best total weight of fish in a club match came from 14 anglers on the last day of November (30th) catching 41 fish for 129 lb 07 oz there was 6 double figure bags. Brian Harland won with 25 lb 10 oz, 7 fish, Denis Thompson 21 lb 07 oz, 5 fish, one of 10 lb 05 oz, the best to date, George Middlemas 15 lb 04 oz one of 6 lb 06 oz, Glenn Kilpatrick had 2 fish of 7 lb 06 oz and 5 lb 02 oz, Adrian Kelly caught 3 fish of 5 lb 13 oz, 5 lb 07 oz and 3 lb 03 oz. The north westerly weather fronts which bring the rough seas were very few with only October and November having the best catches over 500 lb of fish per month, November the best 565 lb, 426 fish. 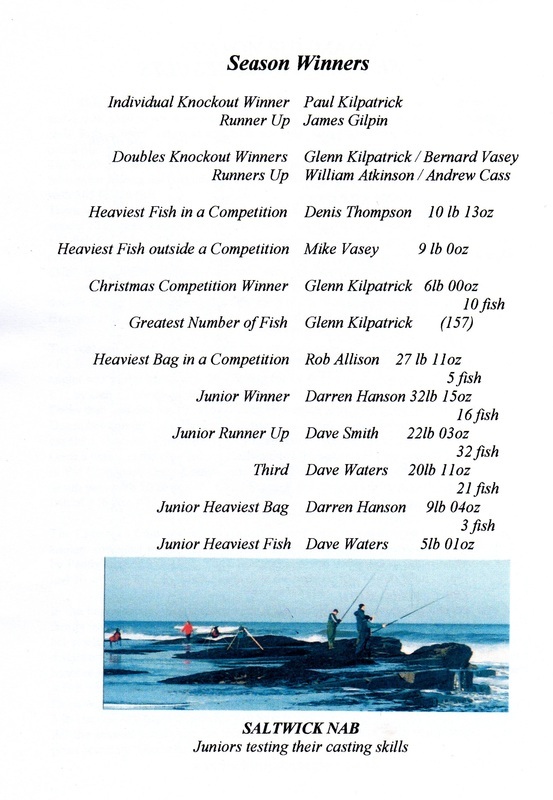 Into December and the next match 4th was the Annual Cloughton open, a heaviest fish competition. The winner was Dave Smith with a fish of 10 lb 04 oz, second place Chris Scaife 8 lb 01½ oz, third was Whitby club angler Adrian Kelly 7 lb 09 oz a personal best. The Christmas Club members only Competition was fished early this year on the 11th December and there was very little movement on a calm night anglers struggled to find fish. Ten anglers weighed-in rockling, whiting and a fine wrasse of 2 lb 10 oz caught by Paddy Hoy. 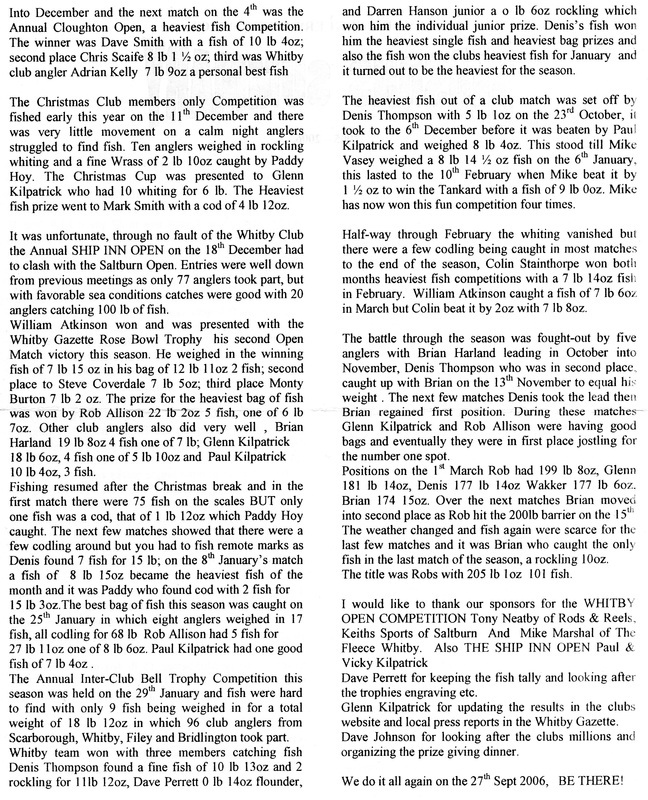 The Christmas Cup was presented to Glenn Kilpatrick who had 10 whitings for 6 lb. The heaviest fish prize went to Mark Smith with a cod of 4 lb 12 oz. 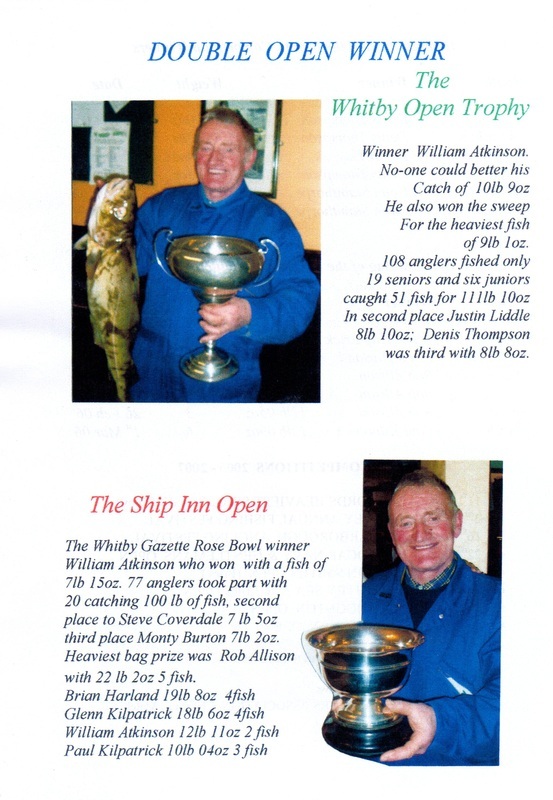 It was unfortunate, though no fault of the Whitby Club the Annual Ship Inn Open on the 18th December had to clash with the Saltburn Open. Entries were well down from previous meetings as only 77 anglers took part, but with favourable sea conditions catches were good with 20 anglers catching 100 lb of fish. William Atkinson won and was presented with the Whitby gazette Rose Bowl Trophy, his second Open Match victory this season. He weighed-in the winning fish of 7 lb 15 oz in his bag of 12 lb 11 oz, 2 fish, second place to Steve Coverdale 7 lb 05 oz, third place Monty Burton 7 lb 02 oz. The prize for the heaviest bag of fish was won by Rob Allison 22 lb 02 oz, 5 fish, one of 6 lb 07 oz. Other club anglers also did well, Brian Harland 19 lb 08 oz, 4 fish, one of 7 lb, Glenn Kilpatrick 18 lb 06 oz, 4 fish, one of 5 lb 10 oz and Paul Kilpatrick 10 lb 04 oz, 3 fish. Fishing resumed after the Christmas break and in the first match there were 75 fish on the scales BUT only one fish was a cod, that of 1 lb 12 oz which Paddy Hoy caught. The next few matches showed that there were a few codling around but you had to fish remote marks as Denis found 7 fish for 15 lb, on the 8th January's match a fish of 8 lb 15 oz became the heaviest fish of the month and it was Paddy Hoy who found cod with 2 fish for 15 lb 03 oz. The best bag of fish this season was caught on 25th January in which eight anglers weighed-in 17 fish, all codling for 68 lb. Rob Allison had 5 fish for 27 lb 11 oz, one of 8 lb 06 oz. Paul Kilpatrick had one good fish of 7 lb 04 oz. The Annual Inter-Club Bell Trophy Competition this season was held on the 29th January and fish were hard to find with only 9 fish being weighed-in for a total weight of 18 lb 12 oz in which 96 club anglers from Scarborough, Whitby, Filey and Bridlington took part. Whitby team won with three members catching fish Denis Thompson found a fine fish of 10 lb 13 oz and 2 rockling for 11 lb 12 oz, Dave Perrett 0 lb 14 oz flounder and Darren Hanson (Jnr) a 0 lb 06 oz rockling which won him the individual junior prize. Denis's fish won him the heaviest single fish and heaviest bag prizes and also won the clubs heaviest fish for January and it turned out to be the heaviest for the season. The heaviest fish out of a club match was set off by Denis Thompson with 5 lb 01 oz on the 23rd October, it took to the 6th December before it was beaten by Paul Kilpatrick and weighed 8 lb 04 oz. This stood till Mike Vasey weighed an 8 lb 14 ½ oz fish on 6th January. This lasted to the 10th February when Mike beat it by 1½ oz to win the Tankard with a fish of 9 lb 00 oz. Mike has now won this fun competition four times. Half way through February the whiting vanished but there were a few codling being caught in most matches to the end of the season, Colin Stainthorpe won both months heaviest fish competitions with a 7 lb 14 oz fish in February. William Atkinson caught a fish of 7 lb 06 oz in March but Colin beat it by 2 oz with 7 lb 08 oz. The battle through the season was fought-out by five anglers with Brian Harland leading in October into November, Denis Thompson who was in second place caught up with Brian on the 13th November to equal his weight. The next few matches Denis took the lead then Brian regained first position. 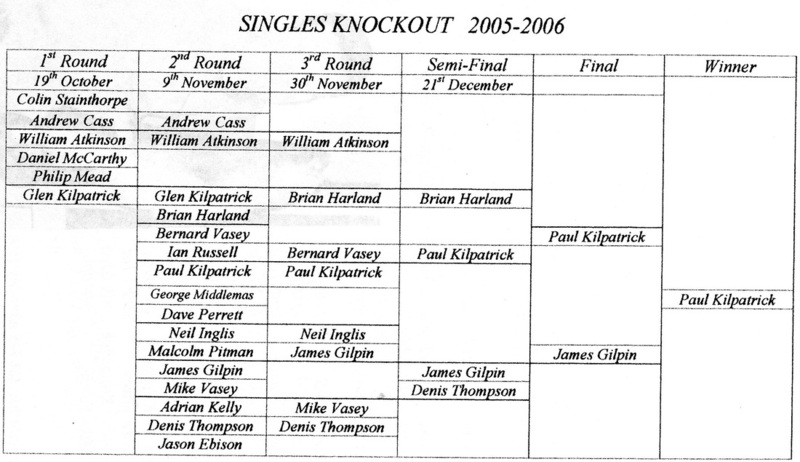 During these matches Glenn Kilpatrick and Rob Allison were having good bags and eventually they were in first place jostling for the number one spot. Positions on the 1st March Rob had 199 lb 08 oz, Glenn 181 lb 14 oz, Denis 177 lb 14 oz, Wakker 177 lb 06 oz, Brian 174 lb 15 oz. Over the next matches Brian moved into second place as Rob hit the 200 lb barrier on the 15th. The weather changed and fish again were scarce for the last few matches and it was Brian who caught the only fish in the last match of the season, a rockling 10 oz. The title was Robs with 205 lb 01 oz, 101 fish. I would also like to thank our sponsors for the Whitby Open Competition Tony Neatby of Rods & Reels, Keith Sports of Saltburn and Mike Marshall of The Fleece Whitby. Also The Ship Inn Open Paul & Vicki Kilpatrick. Dave Perrett for keeping the fish tally and looking after the trophies engraving etc. Glenn Kilpatrick for updating the results in the clubs website and local press reports in the Whitby gazette, Dave Johnson for looking after the clubs millions and organizing the prize giving dinner. We do it all again on the 27th Sept. 2006.